With tile being the most used material in a bathroom, it’s no wonder why the design of the room stems from the tile selected for the space. 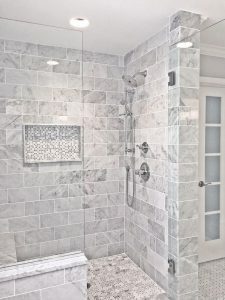 Here are a few tile trends seen in bathrooms being designed today. Homeowner’s are stepping outside the box and experimenting with shapes, textures, and patterns. Hexagons, dimensional tiles, textured pebbles, & herringbone patterns are becoming increasingly popular options when selecting bathroom tile. Large format tiles are used more often in contemporary bathroom designs. By selecting larger tiles (sometimes up to 3 feet wide and 3 feet long) a clean, streamlined look is created. An added bonus…less grout joints means easier cleanability! For a more timeless and traditional design, consider using marble or porcelain marble look-a-like tiles throughout the entire bathroom. Porcelain will not require maintenance like the porous marble. Try mixing and matching sizes and shapes to create a subtle interest to an otherwise uniformed design. Want to keep it safe? When in doubt, think classical. Ceramic subway tiles on walls are perfect for a simple tile design. To add a bit of interest, select larger format subway tile (possibly 4”x12”), try a matte finish, or use a contrasting grout color. These are just a few of the tile trends that are growing in popularity in today’s bathroom designs. 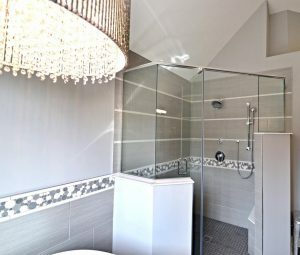 To see samples of these trends or to start designing your bathroom, please visit liveaco.com or give us a call @ 317.575.9540.